UPDATE 17th April: Tidal integration has arrived with the v2.5 update. It can be a bitter spill to swallow – even a choker for some – but music players apps can – and do – sound different to one another. The rationale is this: minimising CPU cycles during playback changes the electrical noise profile of the host device for the better which in turns yields improved SQ. Choices abound for the OS X user looking to improve playback quality over and above iTunes or VLC: Amarra, Pure Music and Audirvana+ are the big three. It’s not ‘Audio-varna’ or ‘Audi-varna’. It’s Audirvana. With an R. ‘Or-dear-varna’. Audirvana+ appears to be the most front foot of the three with updates in a world where streaming now edges out downloads. 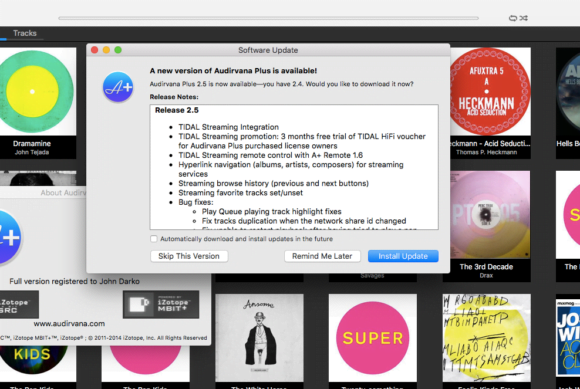 French software developer Damien Plisson broke free of mandatory iTunes library integration with Audirvana+ v2 back in September of 2014 before serving up the A+ Remote iPad app a year later. December 2015’s v2.3 release saw Audirvana+ introduce its most radical value add to date: Qobuz streaming integration. Merry Christmas for some. But not for all. Qobuz availability is restricted to European ears for listeners not running a VPN. France, Germany, UK, Ireland, Netherlands, Belgium, Luxembourg, Switzerland and Austria are all on the inside. On the outer are the USA, Canada and Australia/NZ. Tidal on the other hand offers far broader global coverage that specifically includes the USA, Canada and Australia/NZ. And, as we saw last July, Tidal’s sound quality can be improved by Amarra For Tidal. However, it’s a separate app. What about Tidal integration for Audirvana+? Would that not be swell? After all, the latter sounds quite a bit better to these ears than Tidal’s own OS X app. Wonder no more. 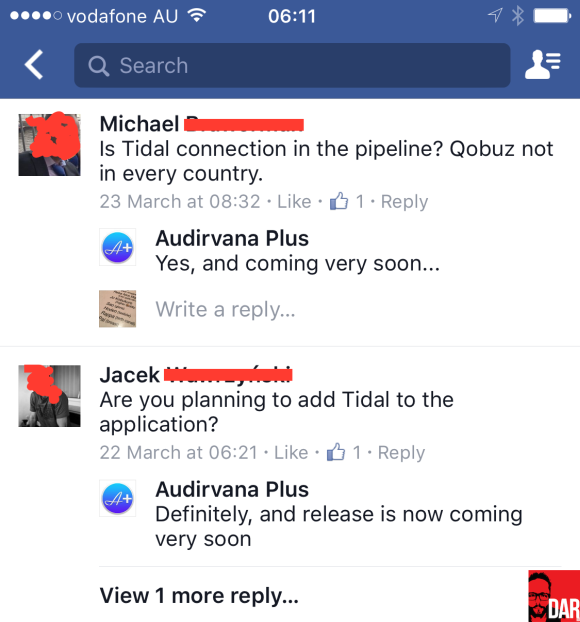 Arriving without press release or fanfare but via blink-and-you’ll-miss-’em comments on Audirvana+’s Facebook page comes news that the conjoining of Audirvana+ and Tidal streaming is not far away close. The upshot for the Audirvana+ user will be that both locally stored files and those streamed from Tidal will benefit from Plisson’s aural massage. As per all v2 updates to Audirvana+, the Tidal loaded version will be made available free of charge to all existing 2.x licence holders. Don’t yet have one? Get on board for US$74 or €59. A real boon for those unable or unwilling to stump up the heavier cash for Roon. Wet your whistle with this ‘How to’ video from Plisson’s YouTube channel in which he shows us how to do Qobuz within v1.6 of the A+ app. Note the explicit mention of Tidal integration on the opening screen. Partnering with Tidal? What? Napster wasn’t willing to do a deal to run on the Blackberry operating system? Hmm…looks like another reason to like my switch last year from Windows/Jplay to iMac/audirvana+. So I’ll soon be doing a bit of streaming along with all my 16/44 ripping. (Like you, I’m 97% 16/44, a position that was totally cemented in concrete with last Spring’s Yggy purchase). 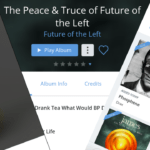 With Tidal, I’ll have to go $20 a month for lossless, correct? Thanks for the continuing info. Your balance of music/audiophilia/market savvy is priceless! Yup, you want the Tidal ‘Hifi’ service. They weren’t kidding. Just got my update. Includes Tidal link and promo for 3 months of free HiFi. Funny thing though, it shows my streaming quality options to be HiRes flac, CD quality lossless flac, and MP3 320. Haven’t used flac since I left Windows — apple/audirvana uses ALAC or AIFF or WAV. I’m a newbie on streaming so will dig into this. Scratch that, my mistake. 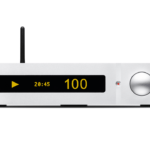 Tidal link shows one HiFi lossless Flac and two lossy AAC available. Sorry for the mis-info. I’ll have a chance to try it out over the next couple days.